Area: 44,8 km², established in 1981. The vast open mires at Hirvisuo are immediately to the north of road 20 (Oulu - Kuusamo). Hirvisuo Mire Reserve is an extremely valuable bird habitat and is a great destination for bird watching excursions. There is a bird watching tower at the mire reserve with an information board detailing the area's mire birds. Ötökkäpolku Nature Trail is a fun 1-km-long nature trail, which you can see for example during a car trip rest break. The nature trail has information on the area's fascinating insects. The duckboards are easy to walk on. 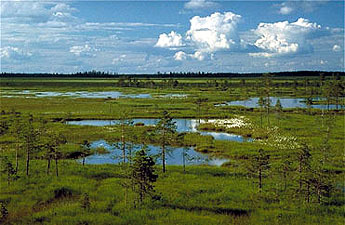 Hirvisuo Mire Reserve is an open aapa bog which is typical of North Ostrobothnia. There are also barren puddle filled raised bogs. The mires are primarily treeless. There are only pine mires lining the area between open bogs and forested islets.